Asian Games 2018: From Gymnast Dipa Karmakar to Shooter Atanu Das, many are in the fray for gold on the day 3 of the Asian Games 2018. On the wrestling mat, Divya Kakran in women's 76kg freestyle category has a favourable draw, while on the men's side Manish and Gyanendra will be in action. 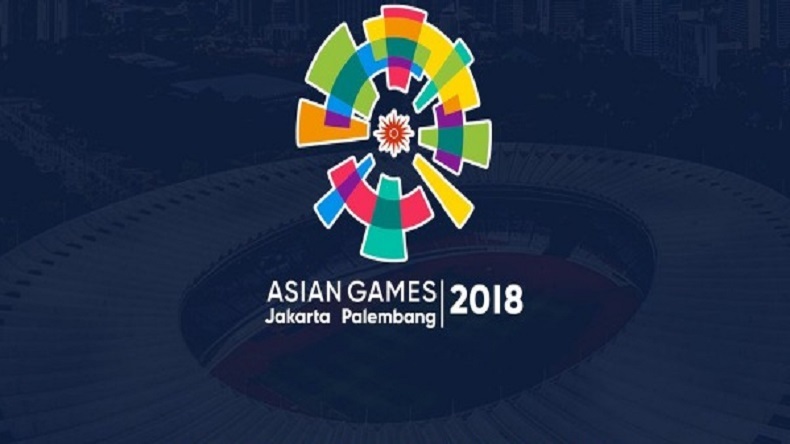 Catch all the live action here from the Asian Games 2018. It’s said that once an athlete overcomes an injury, he/she becomes stronger, wrestler Vinesh Phogat justified the phrase on Monday when she became the first Indian women to win gold in women’s wrestling after leaving the Rio mat in 2016 on a stretcher. Vinesh battered her Rio nemesis Sun Yanan and one of the trickest wrestler known, Japan’s Yuki Irie, en route the golden glory. 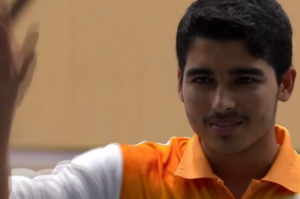 However, Vinesh was not the only one to prove her mettle, Shooter Deepak Kumar made an incredible comeback after trailing on the 5th spot to clinch silver in the men’s 10m Air Rifle event on Asian Games 2018 day 2. 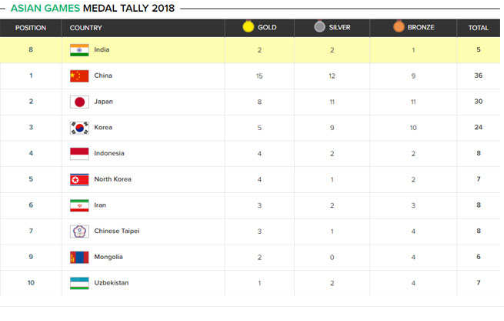 Now, India currently stands at 7th position with 3 Golds, 3 silver and 2 bronze. But the games are just getting started with many more athletes waiting to bring glory to the nation. On the wrestling mat, Divya Kakran in women’s 76kg freestyle category has a favourable draw, while on the men’s side Manish and Gyanendra will be in action. Indian men’s Kabaddi team will take on Sri Lanka Indonesia and Thailand in the group clashes while the badminton teams will take the net by storm in the semifinals at 11 am. China is on top spot with a total of 36 medals. Japan and Korea are at 2nd and 3rd spot respectively. India is at 7th position with 3 golds, 3 silver and 2 bronze. 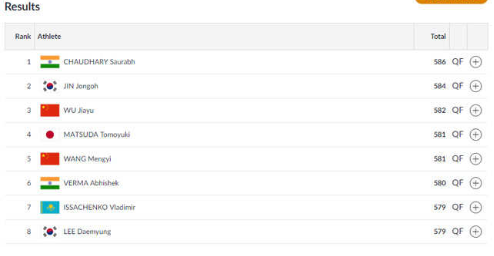 9:16 pm | The day 3 for India concluded with the total of 10 medals. Today, Divya Kakran brought the glory for India with winning bronze in Women’s Freestyle 68kg. 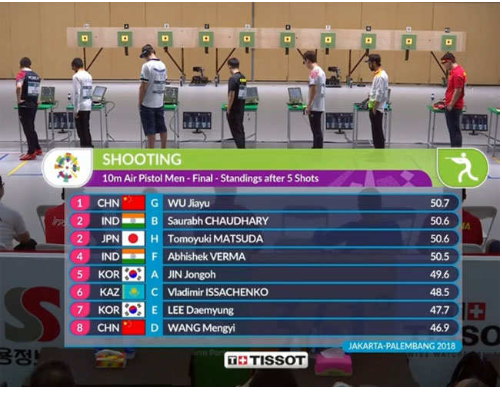 Also, shooter Sanjeev Rajput won silver in men’s 50m Rifle event. In India’s medal tally there are total 10 medals that include 3 golds, 3 silvers and 4 bronzes. 8:26 pm | Indian players did not give a single chance to Kazakhstan players to hit a score. With 21-0, India hammered Kazakhstan to top Women’s Tournament Pool B. 7: 17 pm | India has showcased a remarkable game until now. In the first half, Lalremsiami, Neha Goyal and Navneet Kaur score a goal back to back. The magnificent display of game was then carried forward by Navjot Kaur and Gurjit Kaur. India 7-0 Kazakhstan. 6: 59 pm | India leads Kazakhstan in the second quarter. India 6-0 Kazakhstan. 6:41 pm | India is facing Kazakhstan in Indian Women’s Hockey Tournament Pool B. In the first period, India is in lead 1-0. 6:34 pm | PM Modi congratulated wrestler Divya Kakran for bringing glory to India in Women’s Freestyle 68kg. 05:37 pm | India continues to win another medal in wrestling on the third consecutive day. Divya Kakran wins bronze in Women’s Freestyle 68kg. 5:29 pm | India’s Divya Kakran is fighting for a bronze medal in the women’s freestyle 68kg category. It is 1-1 so far and both of the wrestlers are avoiding taking any risks. Divya is fighting for the bronze against China’s Taipei’s Chen Wenling. 4:56 pm | India wins the Mixed Doubles Round of 32 against Korea 1-2. With the victory, Rohan and Ankita have entered in the mixed doubles Round of 16. In the three sets, they have beaten their Korean opponents Kim Nari and Lee Jeamoon 6-3, 2-6, 11-9. 4:49 pm | Rohan Boppana and Ankita Raina lose the second set. Rohan and Ankita lost the second set to Kim and Jeamoon 6-2. 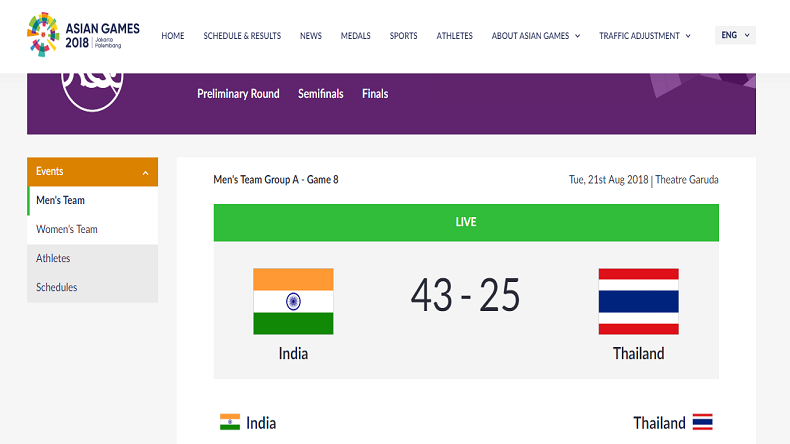 4:27 pm | India beats Thailand 49-30 in Men’s Kabaddi Team Group A. 4:20 pm | Rohan Bopanna and Ankita Raina win the first set. The game of Indian duo was a bit average at the first end but then it won three games back to back and won the first set. 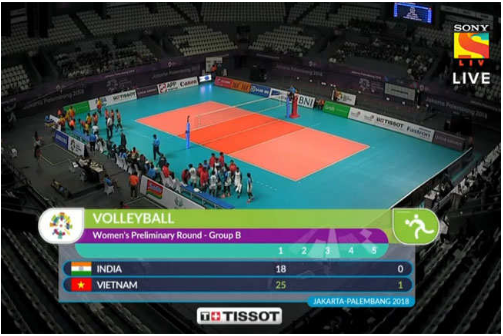 4:01 pm | Currently, India Vs Thailand Kabbadi Group A match is underway. India is maintaining a lead with 28-15 in the second half. 1:30 pm | India now stands at 7th position with 3 golds, 3 silvers and 2 bronze. Our #TOPSAthlete @sanjeevrajput1 wins a silver for #India in men's 50m rifle 3 positions event. He has now won medals in four consecutive Asian Games. 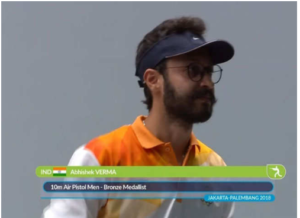 11:00 am | Abhinav Bindra congratulates Saurabh Verma! Superb show by young Saurabh !! Many many Congratulations. We must pledge support to these young athletes for a sustained period of time irrespective of results. They have the ingredients for Olympic success. Needs persistent support irrespective.